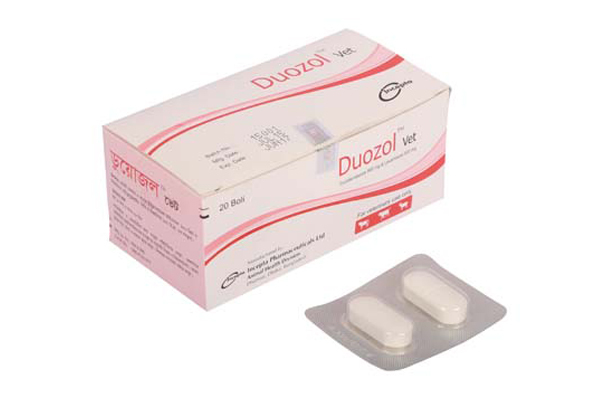 Duozol DS vet bolus: Each bolus contains Triclabendazole INN 1800 mg and Levamisole Hydrochloride BP equivalent to Levamisole 1200 mg. The combination of Triclabendazole and Levamisoleis used for the treatment and control of fascioliosis, gastro-intestinal round worms and lung worm in cattle, sheep and goat. Triclabendazole inhibits energy metabolism and Levamisole inhibits neuromuscular transmission of helminths. Levamisole acts on the neuromuscular junctions of nerves of nematodes as a ganglionic nicotinic acetylcholine agonist, causing muscular contraction of the worm and stimulates the parasympathetic and sympathetic ganglia of susceptible worms. It also interfers with carbohydrate metabolism in nematodes by blocking fumarate reduction and succinate oxidation. Overall effect is paralysis of the worm, allowing it to be expelled. The combination is a broad spectrum anthelmintic used against helminths in cattle, buffalo, sheep, goat etc. The drug is used for the treatment of acute, sub acute and chronic fascioliasis due to early immature and adult stages of Fasciola hepatica &Fasciolagigantica. It is also used against major parasites of ruminant such as Haemonchus and Ostertagia of the abomasum; Cooperia, Trichostrongylus and Bunostomum of the small intestine; Oesophagustomum, Trichuris of the large intestine &Dictyocaulus spp. of the lungs. It is also used for the treatment of eye worms (Thelazia) of cattle. 1 bolus for 150-180 kg b.w. or Triclabendazole 12 mg &Levamisole 8 mg per kg b.w. animal. Triclabendazole and Levamisole bolus to be administered directly into the mouth of the animals, either by dissolving the tablet in water or given as drench or by mixing with molasses or by wrapping the tablet in a banana leaf. The combination is well tolerated at recommended dose. The safety index of Triclabendazole is about 16 times and the safety index of Levamisole is about 3 times than the recommended dosage. But safety index of combination of Triclabendazole&Levamisole is 3 times than the recommended dose. Adequate water should be fed during and after therapy. At recommended dosage in pregnancy no harmful effect has been reported. Moreover, no embryotoxic or teratogenic effects on fetus have been reported.